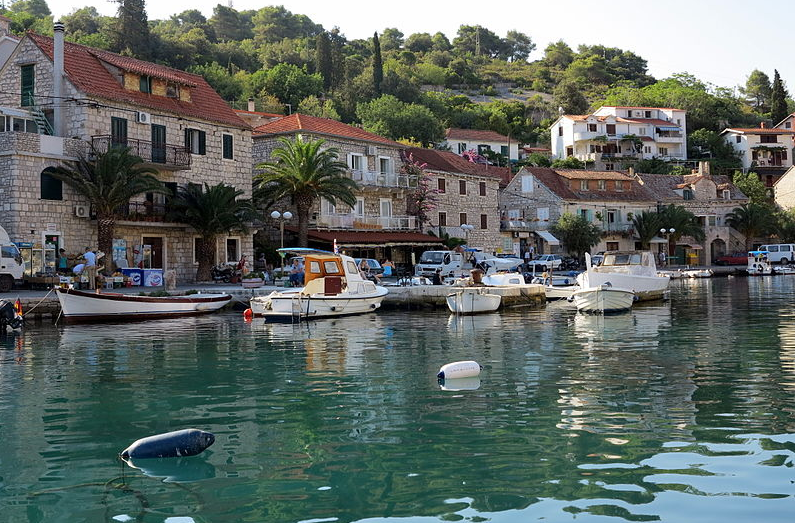 When you’re longing for a Mediterranean vacation, spots like Italy and Greece probably leap to mind, but you should consider Solta, one of the Dalmatian Coast’s islands. It is the island closest off Split, the second-largest Croatian city, and east of the Adriatic Sea. What makes this tiny island so special? Solta is just 11 miles long and 3 miles wide, making it a tiny slice of paradise. There are sprawling hills, deep bays leading to beaches, biking trails, turquoise water, and of course, beautiful sunny weather. The architecture is rustic with ancient Roman structures still standing, so it feels like you’ve stepped back into time. Getting around and to Solta used to be a bit of a hassle for anyone who didn’t have their own boat or couldn’t afford the sometimes-high cost of renting one, but now there’s uberBOAT. Solta’s history runs deep. The first legends from the area involve Queen Teuta of an Illyrian tribe. She supposedly built the castle above the Senjska Bay, which she named “Mir,” which means “Peace.” Fishermen with questions for the queen would be required to throw their first catch of the day back into the sea. Ancient Greeks called the island “Olyntha,” which means “unripe fig.” After the Greek empire fell, the Romans would travel there for their summer vacations. Emperor Diocletian, a Dalmation who ruled the Roman Empire in the 3rd-century AD, would send people with dangerous opinions off to the island. Not the worst place to be exiled scenery-wise, but living was hard. If you go to Solta, you’ll discover three highlights: olive oil, wine, and honey. The Greeks most likely brought olives to the island, which quickly became their most important crops. You can still find olive trees on Solta that are over 1000 years old. There’s still a very old olive-oil mill that you can visit. All the olives are picked by hand and cold-processed in the mill. If you’re a wine lover, you’ll find the variety Dobricic, a deep red, very interesting. It nearly went extinct and was restored by Solta locals in 2005. As for honey, local bees love the macchia shrubs and herbs that grow all over the island. Beekeeping has existed on the island since ancient times and the honey is considered one of the best in the world. Solta is the place to go if you just want to relax. There are only 1,500 people living on the island and just a handful of restaurants. Stomorska is where sailors will stop and that’s where you’ll find any shopping and cafes. The center of the island, Grohote, has two supermarkets and the medical center. Activities are pretty laid-back and include olive-oil tasting, wine-tasting, sunbathing, swimming, and biking tours. Since the island is so small, there’s at least one tour that will take you across all of Solta. There’s also Medieval archery at the Oliveto archery club and an ostrich farm. You can stay on Solta in one of the small private apartments, the 3-star Villa Solta, or 5-star luxury Martinis Marchi Heritage Hotel. Villa Solta offers beautiful views, terraces, a swimming pool, close access to the beach, and a private boat that takes guests around the island. For a truly luxurious experience, check out the Martinis Marchi Heritage Hotel, a castle that dates back to 1703. It has its own marina, fancy restaurant and wine cellar, and just seven suites with air conditioning and other amenities. For another European vacation, consider Stockholm, Sweden, which offers tasty food, outdoor sights, and history.